An Arts and Crafts oak extension table with two leaves and handle. 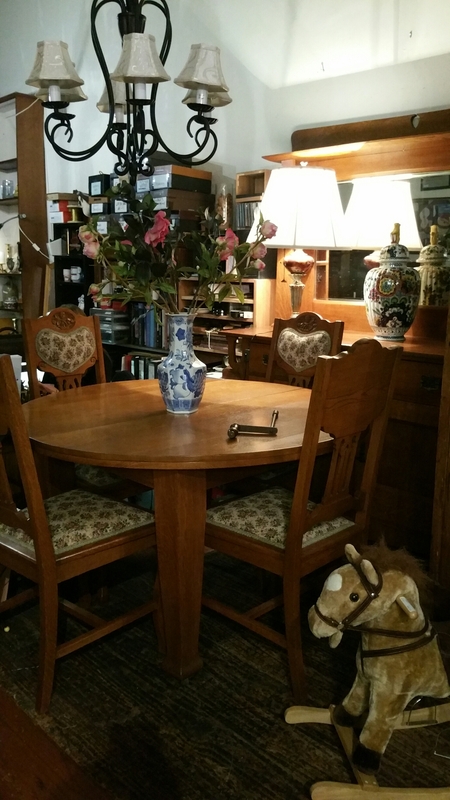 Fully restored and also including six high backed oak chairs. Made in Australia around 1910. $590. Blackwood Arts and Crafts occaassional table $89 and rare meral bound watch box $39. 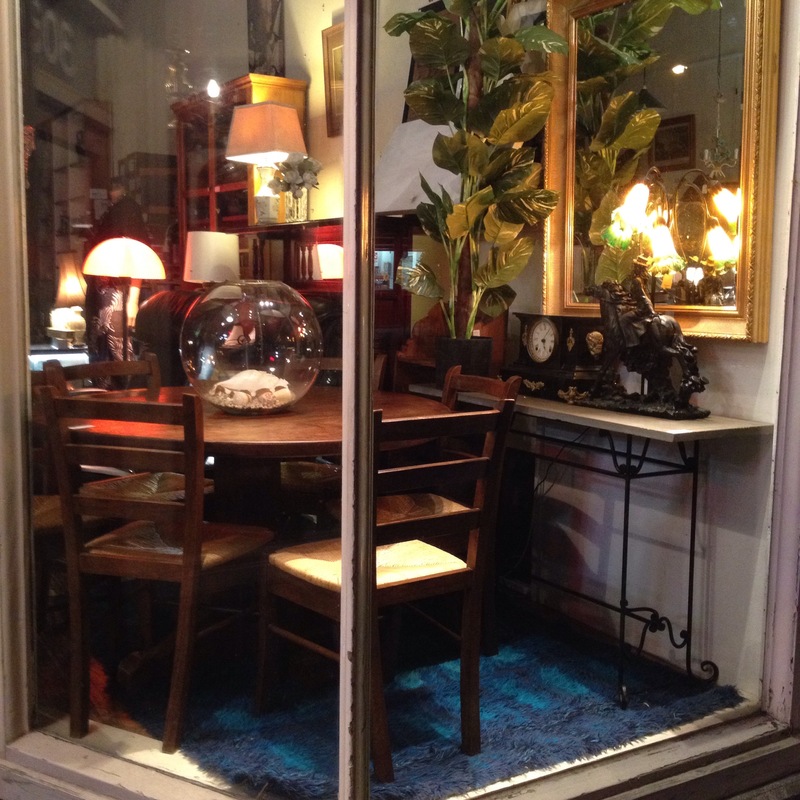 A slate topped table (rectangular) on an iron base $89, round kitchen table to seat 4/6 $385 and 6 rush seated chairs $79 ea. the last two from 1980. Art nouveau (repro) light $99, Prices and other details at grays303.com #antiques #vintagefurniture #retrofurniture #secondhandfurniture #melbournefurniture #antiquefurniture #life #decorate #home #living #melbourne #design #grays #antiquesmelbourne #antiquedecorate antique Ansonia clock in a cast iron body $195. Oh and a massive fishbowl for $59. 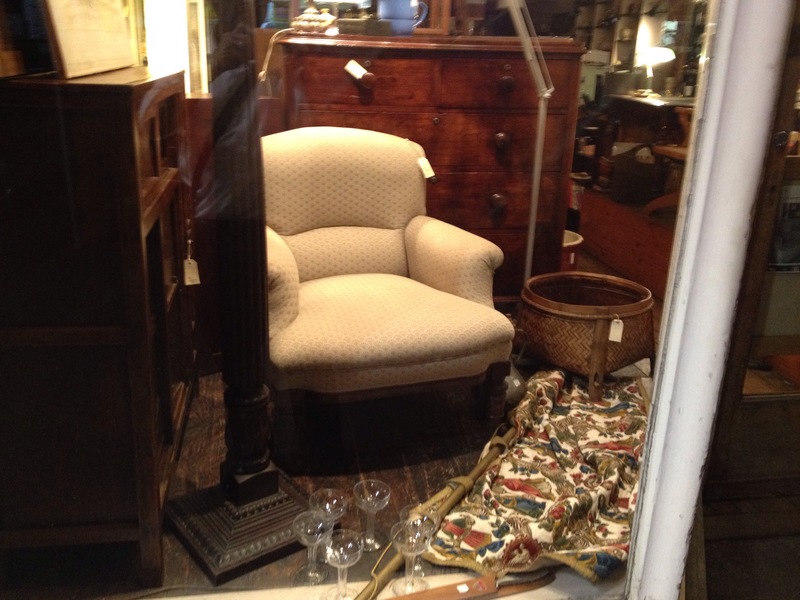 Armchair with turned legs and cedar chest of drawers. Both late 1800’s. Excellent useable order, almost perfect patina on the chest and sympathetic re upholstery on the armchair. $189 for one, and $890 for the other. Can you guess which is less expensive? 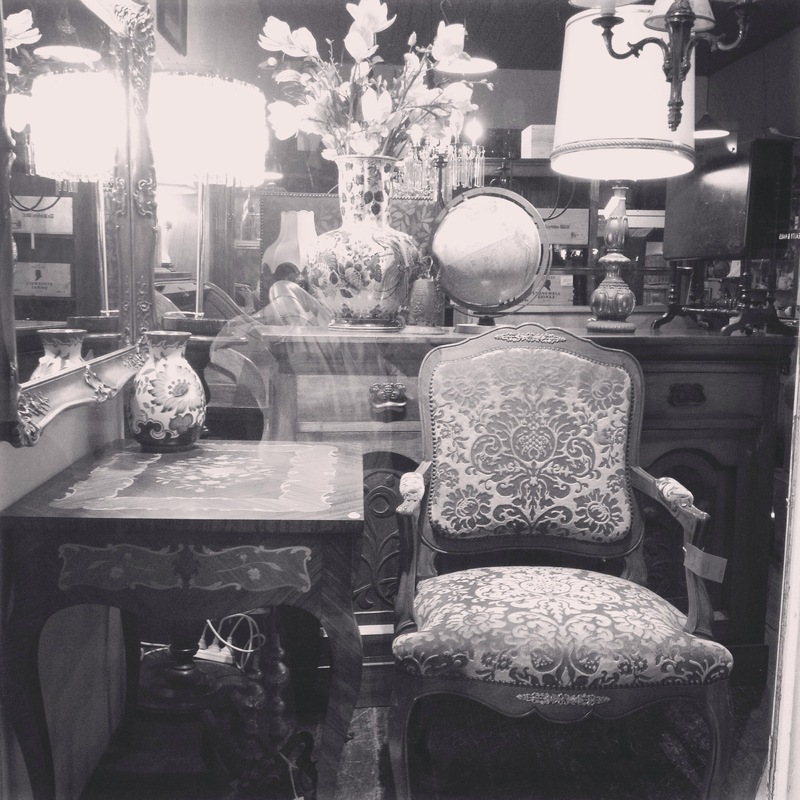 One Grays’ window last night incl one of two French armchairs,$1640 for two. 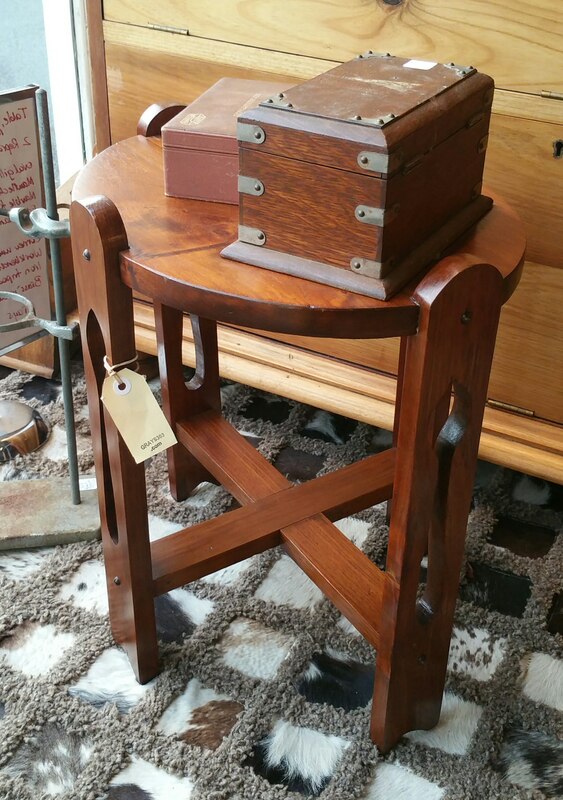 A parquetry side table from the same country $825, and an Australian Blackwood side board from the Arts and Crafts period. $295. Until the advent of affordable colour photography we respectfully advise that the colours are pale blue, various browns from mid to light and dark brown respectively. 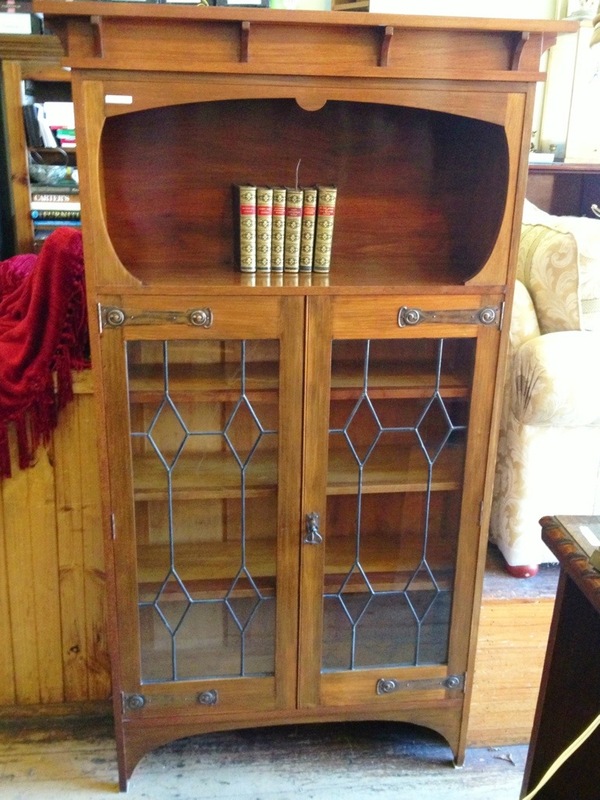 Standing 185 cms high this Blackwood bookcase was made in Australia in the 1920’s. It is unusual in combining the decorated open bookshelf space above , and the intact leadlight doors below. $770.